Holocaust Controversies: Germar Rudolf doubles down on John Ball's Babiy Yar lie. Germar Rudolf doubles down on John Ball's Babiy Yar lie. John Ball's blatant lie about Babiy Yar was exposed by me here back in 2006. 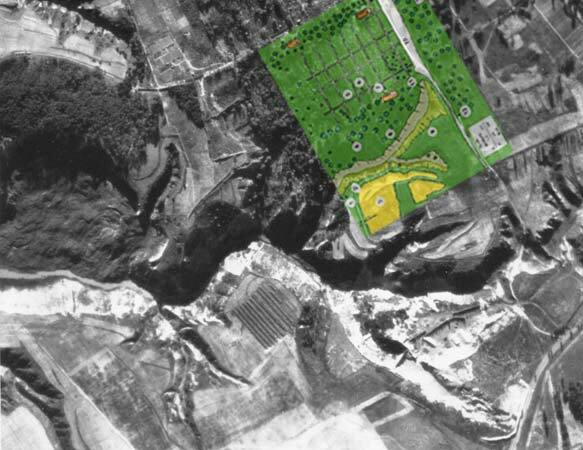 Long story short, Ball lied about the place where the shootings took place in the ravine and "analyzed" the wrong area of the aerial photo. Here, once again, is the photo with Ball's picture overlaid. No witness has claimed shootings took place there. 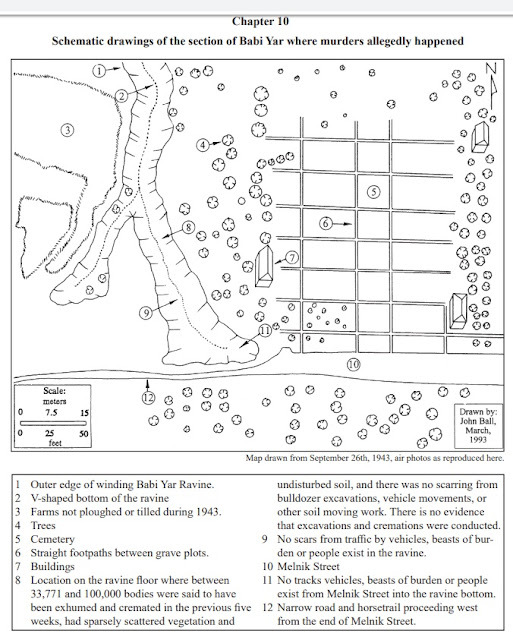 Ball deceptively omitted most of the ravine, including the places where the shootings did take place. Ball's lie was republished under Germar Rudolf's editorship numerous times. Ball's book is the volume 27 of the "Holocaust Handbooks" series and is already in its 5th "corrected and updated edition". The first three editions of this book bore John C. Ball as the author of this work. On Jan. 29, 2015, John requested not to use his name for new editions, but allowed us the use all of the photographic and texual material as we see fit. 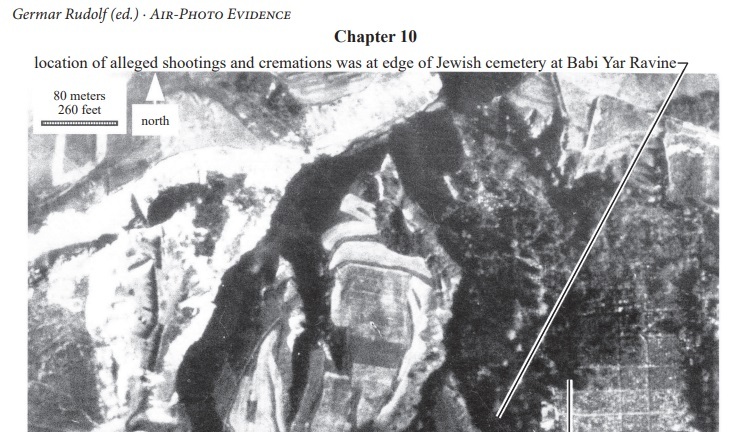 The first edition appeared in 1992 under the title Air Photo Evidence: Auschwitz, Treblinka, Majdanek, Sobibor, Bergen-Belsen, Belzec, Babi Yar, Katyn Forest— World War II photos of alleged mass murder camps! Does evidence confirm or dismiss eye witness stories? 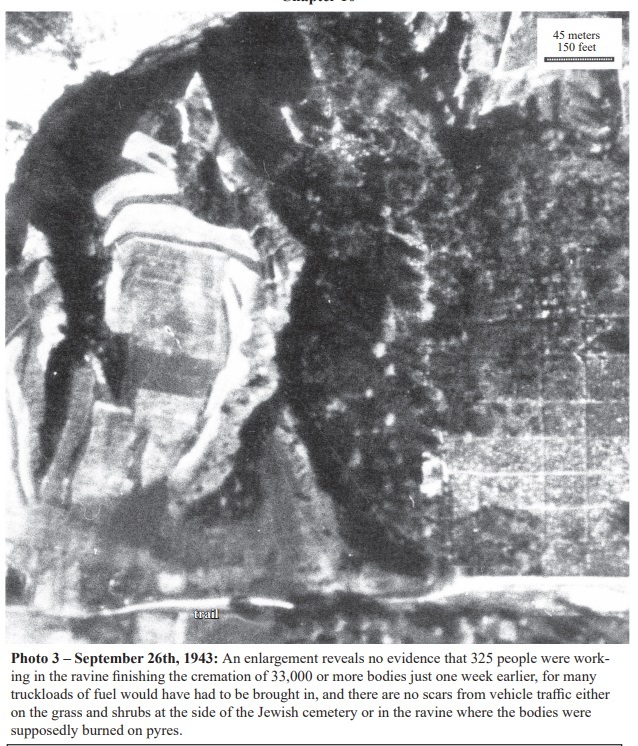 Were gas chamber marks put on by CIA workers?, self-published by the author, Ball Resource Services Ltd., Delta, BC, Canada. The second edition of January 2015 has the same title as the current one and is a marginally corrected reprint of the first edition with a preface similar to the present one plus a number of footnotes added. The third and fourth editions (January 2015, March 2017) resembled the current one closely, except for some updates, corrections and material added. Wrong! This location is not alleged to have been used for shootings or cremations. Fake news! Entirely wrong location. A blatant lie! 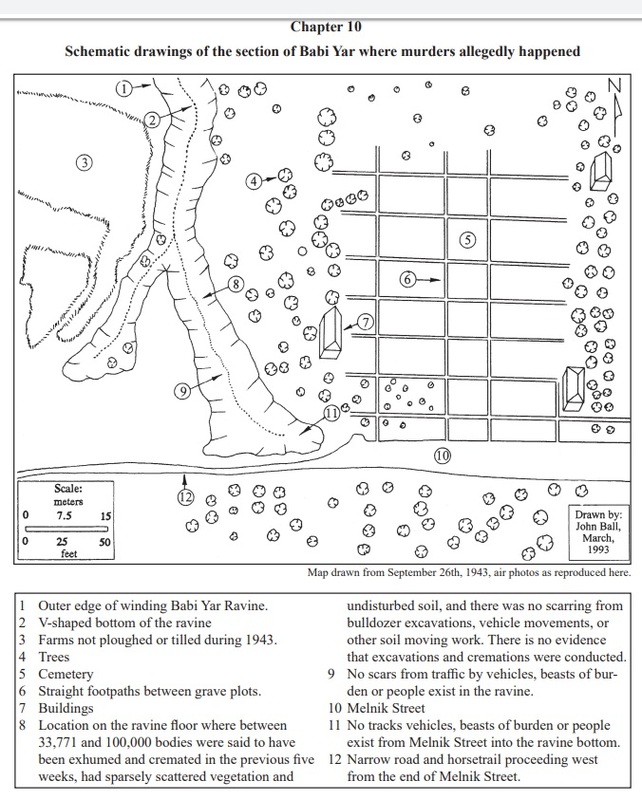 "8" is not the location "where between 33,771 and 100,000 bodies were said to have been exhumed and cremated". Rudolf is well aware of our blog, so he has no excuse whatsoever. Needless to say, this lie fully discredits not only the hoaxer John Ball (about whose other exploits you can read here, here and here) but also the fraud Germar Rudolf, known for his use of numerous fake PhDs in absence of a real one. Perhaps to another topic, Mr. Sergey Romanov and other creators of this blog what are your thoughts about the infamous white supremacist Charlottesville riots (aka "Unite the Right") since a number of neo-Nazi organizations that deny the Holocaust such as the National Socialist Movement, the so-called Traditionalist Worker Party, Vanguard America attended. IMHO it should be obvious that we condemn all neo-Nazi marches and riots. Yes we do condemn the actions of neo-Nazis in places such as Charlottesville where they use their words, fists, torches, bats/clubs, shields, guns, and cars to attack counterprotestors. What evidence do you have to suggest that these photos are faked, and where can the real ones be found? What photos faked? Are you alright in the head? "Fake news! Entirely wrong location." "Wrong! This location is not alleged to have been used for shootings or cremations." Not answering the questions, bub. 2. Are you alright in the head? Incorect starting point. I never said they were faked. The article said they were faked. I am asking HC for proof that they were faked. not the same thing as saying the photo was faked. Asking Sergey whether he is a Zionist sounds like projection on your part. If your denial of the Holocaust is motivated by anti-Zionism, then do not assume that opposition to Holocaust denial is motivated by Zionism, whatever you think that actually means. Zionism is the term used to describe the Jewish national movement, so it's arguably irrelevant after 1948. It only makes sense after 1948 for Jews, who could be opposed to Jewish nationalism and thus be anti-Zionist, or who could be supportive of Jewish nationalism, and thus might support an explicitly labelled Zionist organisation. It makes no sense for non-Jews, any more than it makes sense to ask a German whether they are a Serbian nationalist or a Basque nationalist. Sergey is Russian, so asking him whether he is a 'Zionist' makes no sense. The only Jewish member of the HC blog team, Andrew Mathis, does not consider himself to be a Zionist. Most of the HC blog team are European - mainly Germans, Russians and Brits, all thus from countries with a direct interest in events in modern European history. Babi Yar was in any case an event in modern European history and has nothing to do with Israel. Had Babi Yar not happened, then Israel would have still likely come into being, because the Nazis had driven out enough German Jews to make the Jewish community in Mandate Palestine viable by 1939, well before the extermination of European Jews began. Had Israel not come into being, because Arab invasions succeeded in 1948, then Babi Yar would still have happened. > Incorect starting point. I never said they were faked. The article said they were faked. I am asking HC for proof that they were faked. The article didn't say any such thing, so you expose yourself as an idiot. Yet clearly you aren't alright in the head. > Are you a Zionist? I don't identify myself as such.